"A true professional in her field." 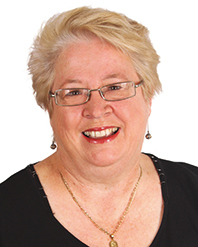 Christine Jeyes has been in property management since 1991 and with Eves since 1995. In over twenty years with Eves she has seen it grow to a large company without losing its "grassroots family culture" where staff are felt valued and given plenty of support. Christine has owned properties throughout her adult life; rentals and family homes. Prior experience as a retail business owner and a real estate sales person enhanced her repertoire of skills needed to deal with the diverse nature of property management. "I love interacting with people and this career provides the ideal opportunity to do so in a very satisfying way." While she works with all types of properties Christine's experience has taught her that some properties are better rental prospects than others. She is always happy to share her knowledge with prospective investors to ensure that property purchase will deliver them the best result and return on their investment. Christine has a portfolio of some 160 properties, many owned by established clients for whom she has managed properties for many years. We have been renting out our Papamoa property for ten years during which time Christine has been our contact at Eves. Any early reservations in relation to not living in the area were quickly dispelled. We have always been kept well informed, have felt Christine has our best interests at heart without ever compromising the wellbeing of our tenants. We have six houses in our family and have used Christine as our rental manager for 12 years. She can be strict with tenants if needed but is always kind too. We appreciate the care and attention Christine gives us as owners, her work being prompt and reports detailed.